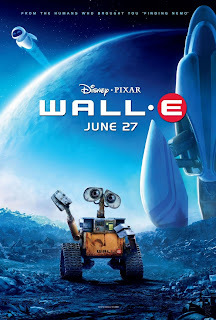 the J list: MOVIE REVIEW: "Wall-E"
Well, Pixar has done it again: they've once more managed to compile so many human elements into a film both enjoyable for adults as well as children- and all with great color and impressive effects. Usually, I bust a gut while watching Pixar movies. They're always well-written with a kiddish-yet-mature charm that makes their films unique. However, Wall-E wasn't exactly meant to make the viewer laugh out loud- but think. This makes me wonder if this movie made sense to young children. Sure, they could enjoy the many different kinds of robots in the film but I'm not sure if the young children would understand the moral of the story. I'm thinking that Al Gore would have enjoyed this film. There is nothing scarier than a future that is sadly realistic and altogether possible; a future where everyone rides around on their hover crafts and everyone is far... really fat. This movie was terrifying to me, in a Day After Tomorrow sort of way. I realize that this won't become a reality in my lifetime or even for the next generation- but someday? Anything is possible. The storyline is pretty basic: "male" robot meets high-tech "female" robot (that could destroy pretty much anything- awesome!) and falls in love... OK, so it's a basic love story with a few robotic twists. I loved the look of low-tech Wall-E and his collection of interesting junk. I loved that the "female" robot, EVE, was super high-tech and looked like an iPod in robot form. Very cool. This movie is definitely worth the rent, I promise you. Just be prepared to 1) explain the storyline to the young ones and 2) think about the future of our planet and what we're doing to it. My official rating: 7.5 junk blocks out of 10.